Several hours after a race that looked relatively boring to the eye, it turned quite interesting. Ohio’s Jack Landis finally broke through on Friday night in a big way. He earned the quickest qualifier award, lead all 100-laps and dominated the field to win by over four seconds in front of Jeff Choquette. “I’m ecstatic,” said Landis. “I’ve come down here the last three years and I see a lot of good guys that run down here. There are so many of them. It is great just to go out there and run with them and win. You are doing something right when you win down here. That statement by Landis was probably echoed three-fold just an hour later. the win to Choquette, moving Mike Fritts up to second and Louis Mechalides up to third. When asked by Speed51.com, race and tech officials declined to comment why Landis was disqualified. By the time the 100-lap Modified race ended, Landis and his crew had already packed up and left for the evening. Speed51.com will have reaction from Landis Saturday evening. Before the disqualification, Landis was more than happy about the win, likely because it came at the expense of the rest of his competitors. To say Landis dominated the race would be an understatement. “I was running from Mike Fritts,” said Landis. “I’ll tell you what, he is a fierce competitor. I never looked in the mirror the whole time. I just told the spotter ‘tell me if they are coming.’ They told me I was pulling away, so I just tried to keep hitting my marks. Jack Landis took all of the pictures, but later, he was DQed for unspecified reasons. coming. With a caution, who knows what would have happened. I’m sure Mike will go home and work on his and I’ll run like a scared dog tomorrow. Jeff Choquette finally returned to his normal for at New Smyrna Speedway on Friday night after two night’s of dismal performances. 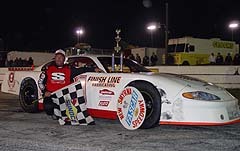 Ironically, Choquette, who had won four-straight races at New Smyrna prior to Speedweeks, finished second (and eventually got the win) in a different car than he has normally run at the track. 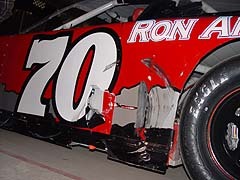 Jeff Choquette had a little bit of damage after a run in with Landis. “We struggled real bad the last couple of days,” said Choquette. “We won four-in-a-row here with our Ford, but we were having problems with the car and it was blowing water our everywhere. We ended up blowing a head gasket. Choquette was likely really happy with the win. In one of the biggest disappointments of Speedweeks, Modified standout turned Super Late Model standout as well, Ted Christopher was not in the starting lineup for Friday night’s Super Late Model race. Christopher had been previously leading the Super Late Model points in his first attempt at running Speedweeks in Super Late Models (he is also running the Modifieds as well, where he is leading the points) before getting involved in an accident and losing the point lead on Thursday evening. On Friday, the team determined the damage to their car was too severe to repair and continue running over the final two nights. “It ended up breaking the block,” said Christopher. “The (owner) didn’t want to fix it. It is too bad too. We had a good shot at probably winning the points in that thing. There was just too much damage though. With TC out of the running, Super Late Model points leader Louis Mechalides has his eyes set on one challenger… Mike Fritts. 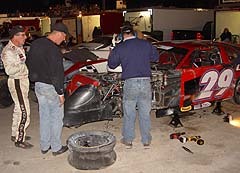 Ted Christopher (left) looks over the damage to his Super Late Model on Thursday night. Fritts finished one spot ahead of Mechalides on Friday night. Now, the two have set up for a battle on Saturday night. “Mike Fritts is real fast,” said Mechalides. “He can win and I can finish back, so all you can do is try as hard as you can every night. Louis Mechalides (#47) has lots of good thigns to say about Mike Fritts (#112). As for Friday night’s race, Mechalides just rode and came home third after Landis’ disqualification. “There was not much passing out there. We have a bunch of fast cars. When you have that many fast cars, they just get in single file line and you can’t pass unless someone makes a mistake. I just rode around to wait for something. After what has been a trying week, Justin Drawdy earned a fourth-place finish on Friday night. What Justin has went through this week, outside of what has happened on the track, has been unusual to say the best. “We came to the track on Monday and my crew chief heard from someone that Freddie Query and Wayne Anderson (both of which are helping out younger drivers in Speedweeks) were getting paid. He never said anything to us before. He came up to my father and said that if we wanted to sit on the pole and be like how we used to be, we needed to pay him. He said he’s been messing with our car all week. It is a bad deal. It shocked me. I never had any problem with him before at all. Justin Drawdy is finally turning his week around. “So we took Wednesday off to regroup and get the car back to square one. It is not like it used to be, but we are getting it back to close. Jay Middleton (left) was swept up in an accident. 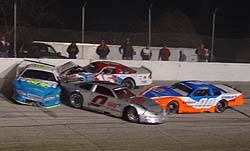 Jay Middleton continued to suffer through some late week bad luck at New Smyrna Speedway. 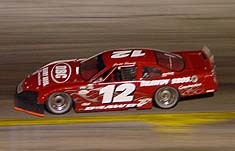 Middlton got “dumped” on the first lap of Friday night’s race and finished 24th. “I got hooked,” said a dejected Middleton. “We were on the first lap, coming out of the second corner and I guess the 19 (JR McMichel) got loose or something. He came down and hooked me on the right rear and turned me around. He said I pushed him in the wall. I was like whatever. This was as close as Choquette (#70) ever got to Landis (#101).